. . . OR HAS EVER BEEN . . .
​ An original musical comedy revue about being single, from the anxieties of dating to issues in living together, as well as single parenthood, the joys of freedom, social pressures to find a mate, and other relationship joys and woes. The show ran for 7 years in San Francisco, and has had productions in New York, Boston, Los Angeles, San Diego, Las Vegas, Wichita, Vancouver, Singapore and other venues. "A​ smart little show with infectious music and insightful lyrics that satirically by sympathetically defines that misunderstood subculture called Singledom. 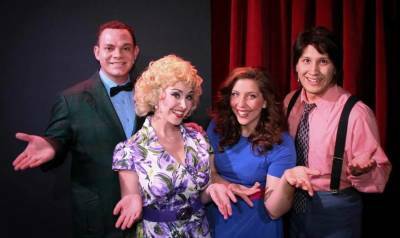 There's no more polished master of the original musical revue than Bobrow. He packs lyrics with comic ideas. Party of One is a party for one and all." "On taget with considerable wit. Hits a tender comic nerve. A sharp, biting and sometimes painful exploration of that socially awkward stage known as being single." "Party of One is a delight. Bobrow writes about Relationships with a capital "R" in a biting, satirical and consistently clever way." "They make us remember our own experiences. They make us laugh, and they make us cry over the state of singlehood. No stone is left unturned. Party of One is not to be missed." "A thoroughly enjoyable evening of musical theater. Smart and sassy. Not to be missed." "A smart, sophisticated, sometimes deliciously naughty romp about the joys and perils of being single in America circa 1986, although the relationship themes are unversal and timeless - a sparkling gem that will leave you on a widely grinning, toe-tapping high. Bobrow has a knack for a surprising, well-turned phrase. And in the music, he plays with various styles, throwing in an unexpected tango beat here or an operatic trill there. Ultimately, the show is about being happy with - and un-apologetic for- being single until you find Mr. or Ms. Right, as encapsulated in the bouncy title tune: 'I'm a party of one and I do what I want 'cause I want to. I don't have to explain. I only answer to me. I pursue any road I get onto. I love to be - free."